The measured values of up to 16 devices can be displayed via the HK6 Display software. The devices will be connected via a RS-485 bus. With one view everything in the grasp !!! 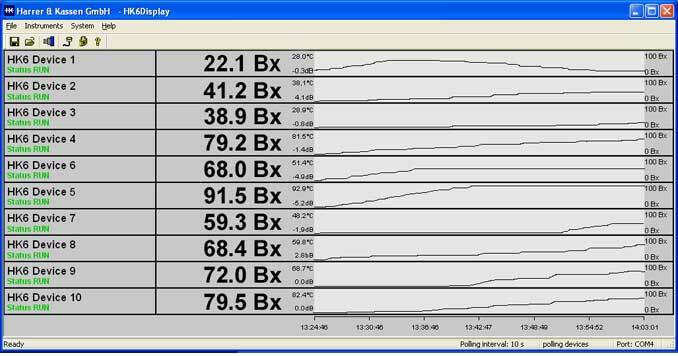 With our HK6 Display software you can verify the measuring results of up to 16 devices at the same time. The instruments will be connected together via optional RS-485 communication port and the measured values will be polled periodically. For a better overview the last 600 values from each device will be plotted in a graph. Additionally you can setup freely definable threshoulds where the measured value is changing to red when it is outside your range. Thus you 'seized' with only one view whether your product is within the given tolerances or not. Every parameter in the HK6 Display software is editable. Equipment parameters like the calibration, limits and the current output can be configured via the software and transferred to the instrument. For a check or validation of the connected periphery the software is also able to create defined test currents with just a click.